DO hang on to your favourite mascara brush before tossing out your old mascara. A cleaned up mascara wand (or spoolie brush) can be combed through lashes to remove excess mascara or clumps, as well as to help separate the lashes. It's also a great tool for refreshing lashes before applying another coat of mascara and heading out into the evening (add a light sprinkle of water to the brush and wiggle across lashes to soften the dried mascara, then apply your next coat). 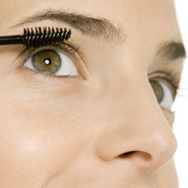 DO switch to less emollient eye creams or concealers if your mascara always smears. If you consistently have this issue no matter what kind of mascara you try, there is a good chance your eye-area products may be a contributing factor. Rich, emollient moisturisers, eye creams, or creamy concealers can cause mascara to break down and smear (even waterproof versions, which hold up well against water, but not oils). Consider switching to a lighter (less greasy) version of your eye-area products to see if that helps stop the smudging and smearing.